Fort Wayne has farmers markets in the middle of the cold cold winter, which gives me a head start on discovering all sorts of local goodies. The maple syrup is amazing and I was very excited to see so many vendors considering the weather. One of my finds was a small bag of locally grown potatoes which was destined to become soup. 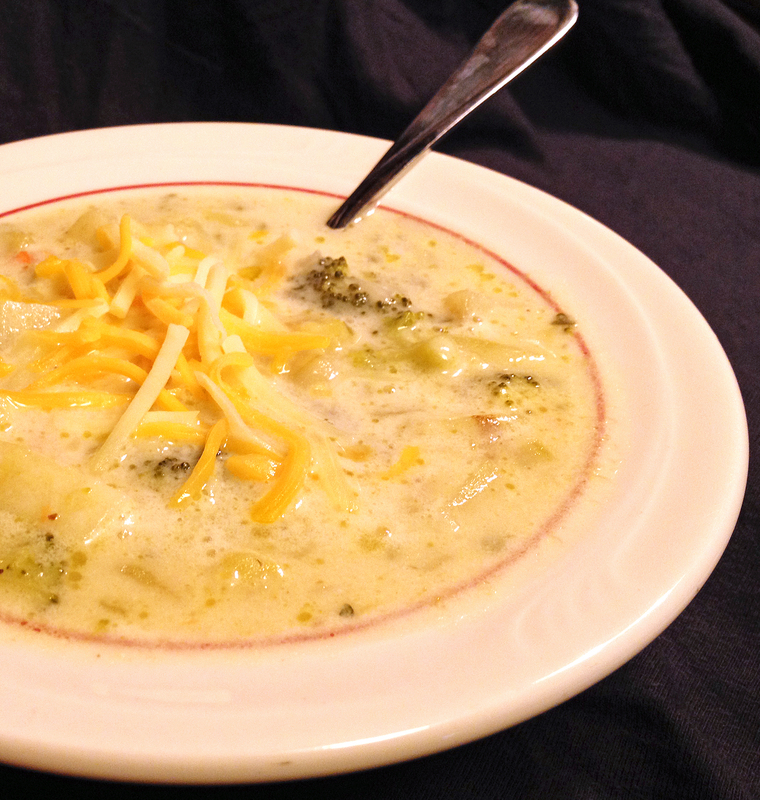 This potato broccoli soup is inspired by The Pioneer Woman’s Perfect Potato Soup. I added the broccoli and mushrooms since I love them and happened to have them handy; they really change this to be more of a chowder since it’s thick and heavy. What makes it chowder? I don’t know, but it sounds good, and isn’t that a great word? This creamy soup is heartwarming and yummy so it’s okay that it isn’t the prettiest soup out there. The blending step is important for the right texture – the photos are before blending, since my immersion blender is in a box someplace. Any large soup pot will work for this. I’m giving my dutch oven a good workout and using it for just about everything I cook lately. These things are amazing, how did I go for so long without one? Melt butter in large pot. Add onions, carrots, celery, and mushrooms. Cook for about ten minutes on medium-high, until soft. Add potatoes and broccoli, stir. Cook for a few minutes. Add stock/broth and stir. Bring to a boil, then turn down to a simmer for 10-15 minutes or until potatoes are almost cooked. Whisk the flour with 1 milk until smooth, then add to the soup and cook for another 5 minutes. Add salt, pepper, parsley, and the 1/2 cup of heavy cream. Process with an immersion blender, or very carefully run small batches in a blender until the soup is the consistency you like. Serve with a sprinkle of grated cheese and a dollop of sour cream. This entry was posted in Dinners and tagged dutch oven, potatoes, soup, vegetarian, winter.